Though at first glance it may look like a theater set for a children’s fairytale, PearlDamour’s (Katie Pearl and Lisa D’Amour) How to Build a Forest has more to it than that. 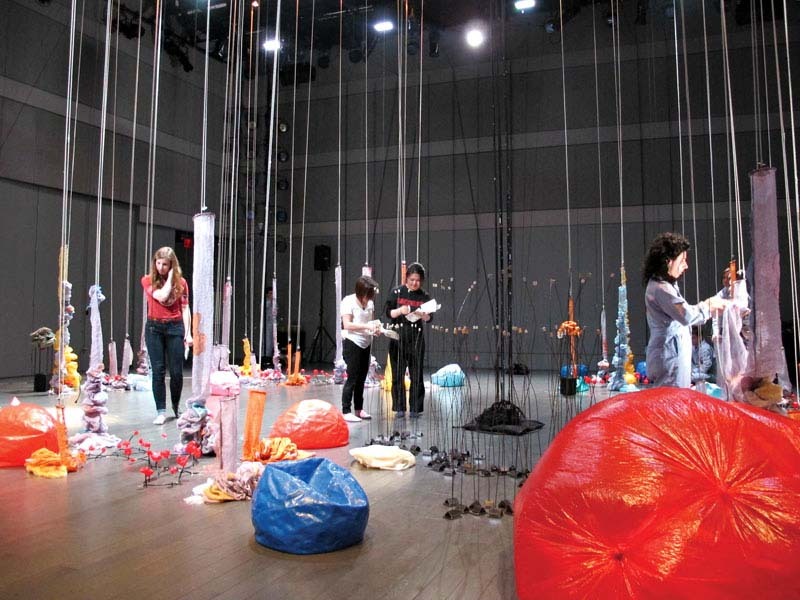 Em stopped by the team’s latest installation, of their previously-staged performance art piece, last week at Brown University’s Granoff Center. 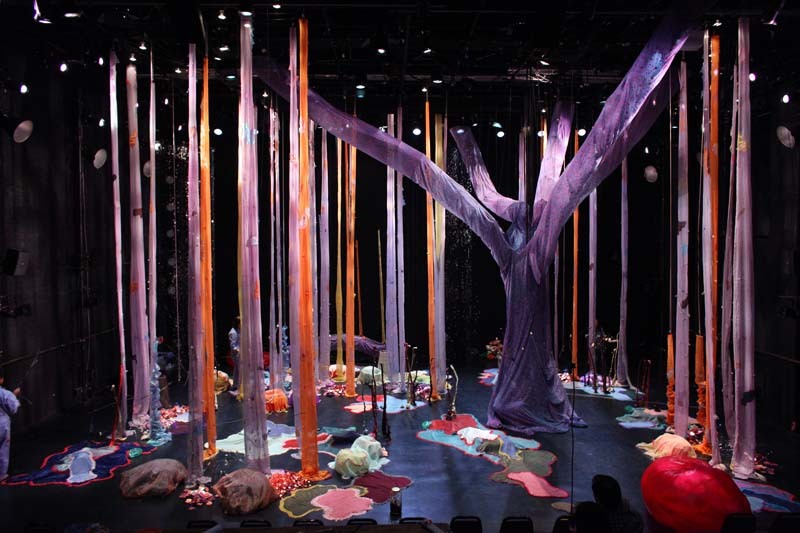 Part visual art installation and part theater performance How to Build a Forest unfolds over an 8-hour period, beginning on an empty stage which is slowly transformed by the artists and their volunteers into a coloful, dense and willowy slip-covered forest. Viewers are urged to walk through and interact with the installation as well as ask (or answer) questions of the forest rangers on hand. Field guides were distributed that include a manifesto on the beauty and fragility of our environment. Visitors are given an opportunity to witness an ecosystem in progress as well as question where things go when we are done with them. Despite the loud sounds by the builders and metal wires, the installation has a meditative quality. Brown’s Granoff center was the smallest of the venues where How to Build a Forest was shown, but others include The Kitchen in NYC and Duke University. At the end of the 8 hours on each day of the exhibit/performance the forest was torn down while the builders spoke poetic words of warning, then walked off leaving an empty, stark performance space. Here’s a time lapse video of the entire 8 hours on the left. This entry was posted in Art, Event, Interaction Design, Stuff We Like. Bookmark the permalink.